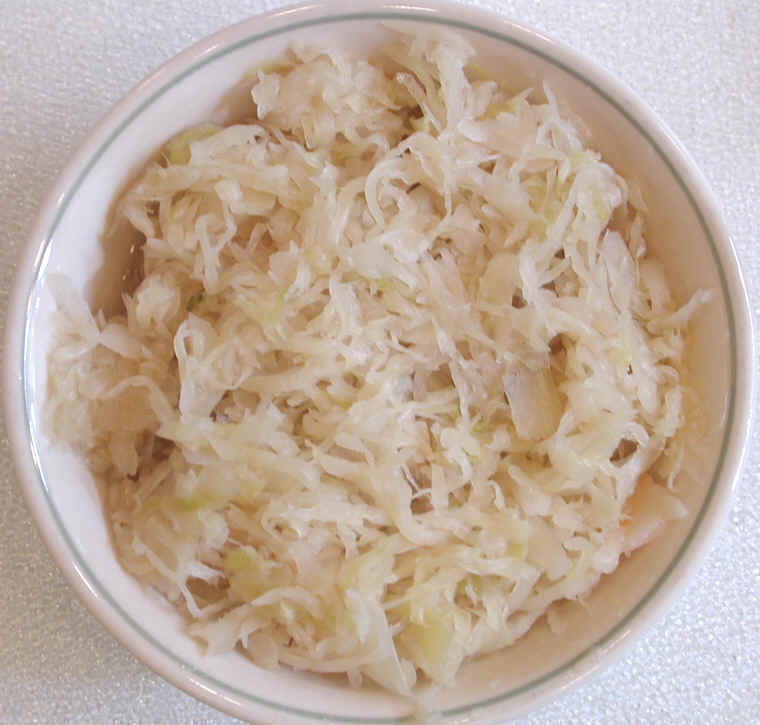 Sauerkraut is finely cut cabbage that has been fermented by various lactic acid bacteria, including Leuconostoc, Lactobacillus, and Pediococcus. It has a long shelf-life and a distinctive sour flavor, both of which result from the lactic acid that forms when the bacteria ferment the sugars in the cabbage. Sauerkraut is also used as a condiment upon various foods, such as meat dishes and hot dogs. In Germany, sauerkraut is often flavored with juniper berries. Traditionally it is served with pork, Strasbourg sausage or frankfurters, bacon, smoked pork or smoked Morteau or Montbéliard sausages, accompanied typically by roasted or steamed potatoes or dumplings. Sauerkraut is the main ingredient of the Alsatian meal choucroute garnie (French for dressed sauerkraut), sauerkraut with sausages and other salted meats and charcuterie, and often potatoes. 1. It is a source of vitamins C, B, and K; the fermentation process increases the bioavailability of nutrients rendering sauerkraut even more nutritious than the original cabbage. It is also low in calories and high in calcium and magnesium, and it is a very good source of dietary fiber, folate, iron, potassium, copper and manganese. 2. If unpasteurized and uncooked, sauerkraut also contains live lactobacilli and beneficial microbes and is rich in enzymes. The fiber and supply of probiotics improve digestion and promote the growth of healthy bowel flora, protecting against many diseases of the digestive tract. Recipe for Sauerkraut see Here, Here and Here.